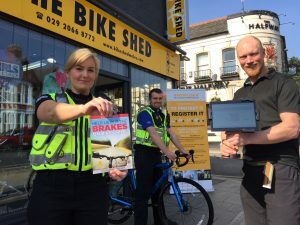 Durham Police have launched ‘Operation Spoke’ a initiative aimed at reducing bicycle theft across County Durham & Darlington. As part of Operation Spoke Durham Constabulary will be working closely with local cycle retailers, Immobilise.com and other organisations to introduce a bicycle marking scheme to property mark and register bicycles in County Durham and Darlington. The aim of the scheme is that every new cycle sold will be marked and registered to their new owner. Current bicycle owners can also attend their local cycle retailers, police stations and other cycle marking events to have their cycle(s) marked and registered under the scheme. This really is a fantastic opportunity for anyone wishing to protect their bicycle, a simple yet highly effective method of preventing a bicycle from being taken and it takes only a few minutes. All customers who sign up to the scheme will be asked to complete a registration document, details provided will then be put onto a database so that Police can check the identity of cycles to identify them and to target bicycle thieves. The key benefit of the scheme is that should a bicycle be stolen it will be easy to identify by police. This means a stolen bicycle will be easy to return to a rightful owner. I am also hopeful that the introduction of this scheme will be a deterrent to bicycle thieves. The message I want to send out is simple; if you are buying a new bicycle for Christmas this year or indeed into 2014, please register it with your retailer as part of Operation Spoke. Our aim is to get as many bikes as possible registered under the scheme, reducing the opportunity for bicycle theft across our force area. People are asked to contact their local neighbourhood policing team, police station or cycle retailer for further information about the scheme. The Wilts & Gloucestershire Standard have reported that Police officers are hoping to get cyclists back on their bikes by reuniting owners with lost and stolen bicycles. We run these viewings on a regular basis and often have some really good results. It is worth popping along as there is a chance you could get your stolen bicycle back. Anyone wanting to attend must bring their crime letter with them. All those who have reported their bike stolen will have received a letter with a unique crime number on it. Officers will be offering security marking and crime prevention advice as well as encouraging cyclists to register their bikes on immobilise. Recipero is pleased to announce that it recently received the highly regarded Secured by Design (SBD) Award for its services and products, including the Immobilise National Property Register service & products, plus linked services including the Police NMPR service, CheckMEND and Report My Loss, all of which are aimed a helping identify, investigate and deter crime and associated criminality. The Secured by Design Award is the culmination of many months of work that also saw Recipero become both ISO9001 (Quality Management) and ISO27001 (Information Security Management) certified. Secured by Design is the initiative from the Association of Chief Police Officers (ACPO) that aims to reduce crime and calls for the use of services or installation of security solutions that meet police-approved standards. Businesses whose services and/or products have been certified by an accredited testing body to the specified standards, can apply for SBD membership and licence to utilise the scheme’s logo. The SBD logo is the only symbol that guarantees national Police approval of a product or service, providing customers with reassurance that the solution provides a proven level of resistance to criminal attack. Utilising SBD-accredited services and security products is a quick and simple way to ensure compliance with new guidelines. Consumers and specifiers are also recognising that SBD provides an easy route to help identify which of the many technical standards indicates a service or product is an effective crime prevention measure. Gaining SBD approval for our services is a significant achievement, and demonstrates Recipero’s commitment to data security and product quality. It also serves to provide Recipero’s valued customers with reassurance that we continue to meet the high standards we have reputation for delivering. Cycle theft in Sheffield is a growing problem according to recent report in the Star. It was reported that only 41 of the 1,595 bicycles stolen from Sheffield city centre in the last 10 years have ever been recovered by police. The number of bike thefts in the city has soared in the last decade, particularly around the railway station and the universities. With the average stolen bike costing just under £400, that means cyclists in Sheffield have been saddled with a bill of £638,000. Over the last couple of years bike theft has gone up and up. We have caught two or three thieves who were out stealing bikes all the time, and taking those few out of the equation has definitely curbed bike theft. Officers also have another weapon in their armoury – the tracker bike. The GPS-enabled bikes are locked at theft hotspots and left unguarded to tempt thieves. If stolen, the device alerts police by text and officers use Google Earth to pinpoint its location. Sgt Nugent advised cyclists to spend at least 10 per cent of their bike’s value on a lock and said two locks were always better than one. He also urged bikers to register their property at Immobilise – the UK national property register. Following string of bike thefts and a successful operation to catch the thieves responsible Bristol police have made several suggestions on how to avoid becoming a victime of bicycle related crime. Police are urging people to always secure their bikes and to take with them any objects that can be removed. Always use two different locks. 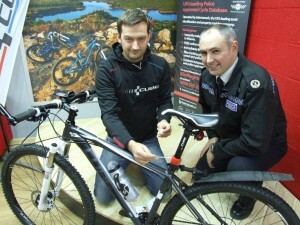 York police are urging residents to ‘spoke up’ against cycle thieves. Officers launched Operation Spoke in January 2010 as a deterrent to combat cycle theft and as a quick and easy way to reunite stolen bikes with their rightful owners. Since the initiative began, almost 10,000 bikes have been security marked and registered with North Yorkshire Police and the national property register, Immobilise. All cycle owners are being urged to sign up to the scheme, so that police can identify who stolen bikes belong to when they are recovered. Officers are currently tying to trace the owners of a cycle which was targeted last month – who could have been easily traced if they had taken advantage of the free security marking offered by Operation Spoke. At around 8pm on Friday 3 June 2011, police recovered a bike at the cycle racks near the Minster after someone had made an attempt to steal it. The bike is in police possession but as yet the owner is unknown and police are urging anyone who believes it belongs to them to come forward. If this is your bike contact North Yorkshire Police on 0845 60 60 24 7, quoting reference number 12110090973. 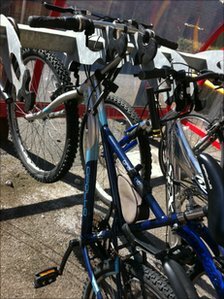 Officers are also trying to trace the owner of a black or grey Cannondale Bad Boy hybrid cycle which was stolen from the cycle racks on Tanner’s Moat, outside The Maltings at around 1.40pm on Tuesday 28 June 2011. A 17-year-old youth was arrested in connection with the theft, however officers need the owner of the bike to come forward and report it stolen. If you believe this was your cycle, contact North Yorkshire Police on 0845 60 60 24 7, quoting reference number 12110106413. Cycles are often a target for thieves and it is important that people take action to protect their property. It is advisable to buy a good quality bike lock and if possible use two different styles of lock, as thieves are rarely equipped to break both. Everyone should also consider having their bike ‘spoked’ to make it easier for the police to catch offenders and return your bike if it stolen. Security tagging involves having a unique mark placed on the frame of your bike which can then be matched to key details stored on the police database such as make, model and frame number. The process is simple, quick and free and can be done at the Bike Rescue Project under Lendal Bridge or at regular Operation Spoke events held throughout the city.